When Peter Fardy joined Dalhousie nine years ago, it was to serve as assistant vice-president, of the Office of Advancement and chief development officer. 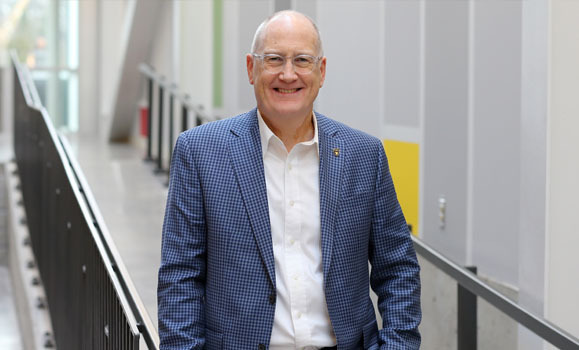 But his job would change significantly when he was asked to take on the vice-president’s role — initially on an acting basis, then permanently — and to work more closely with Dal’s president, Richard Florizone. Fundraising then becomes more about building partnerships with people based on shared interests, joining together to accomplish things that neither they nor the University can on their own. For Fardy, who comes from a place known for its cultural authenticity, this natural approach is a good fit. He grew up in St. John’s in a family of Irish descendants. His father worked at the CBC and was transferred to Halifax in 1974, when Peter was 12. He got involved in competitive canoeing, at first as a way to make new friends. Looking back, he credits sport for a significant amount of his personal success. “It transformed me from a shy, introverted kid to being a team player,” he says. “When I think about the leadership I’m now called on to demonstrate, it really made a big difference in terms of my self-confidence.” He went on to coach high performing athletes and later served as a long-time volunteer in the sport. On a daily basis, Fardy tries to focus on three big-picture items: identifying new opportunities for transformative gifts; developing and implementing a solid overall growth strategy; and helping his colleagues in Advancement succeed in their roles. “Of course, some days it feels more like playing Space Invaders,” he says, reacting to issues and opportunities as they come at you from all directions. “You don’t have to choose between effectiveness and fun." When you were a student, what was your favourite course? "I don’t know why, but in undergrad I really enjoyed statistics and computer science in first year. In second year, I realized I wasn’t cut out for those. During my MBA, my favourite was a piece of consulting work and our client happened to be Dalhousie." What’s your favourite hobby or pastime? "Stand-up paddle boarding—it’s a great way for a guy of my vintage to continue in my sport. I’ll go paddling for hours when I have the time, on the Northwest Arm or on the Northumberland Strait." “Just make sure that whatever business you’re in, you genuinely enjoy spending time with the type of people you will be dealing with. If you don’t, you’re in the wrong business.” That’s why I like my work. Who is a mentor or leader that’s inspired you in your life or career? I’ve had a few over the years, so it’s hard to pick one. But what’s common among them is that they inspired me to act and think differently as a leader, gave me license to be ambitious and take risks, and backed that up by ‘taking a bullet for me’ when things don’t go right. If you could have dinner with one person — living, deceased or fictional — who would it be and why? I think I’d have a really interesting dinner with Newfoundland authors Wayne Johnston or Michael Crummy. They speak with genuine voices about where I’m from and what it means to be a Newfoundlander. My favourite novel is Johnston’s The Colony of Unrequited Dreams.